Denver, South Park & Pacific Historical Society Store. 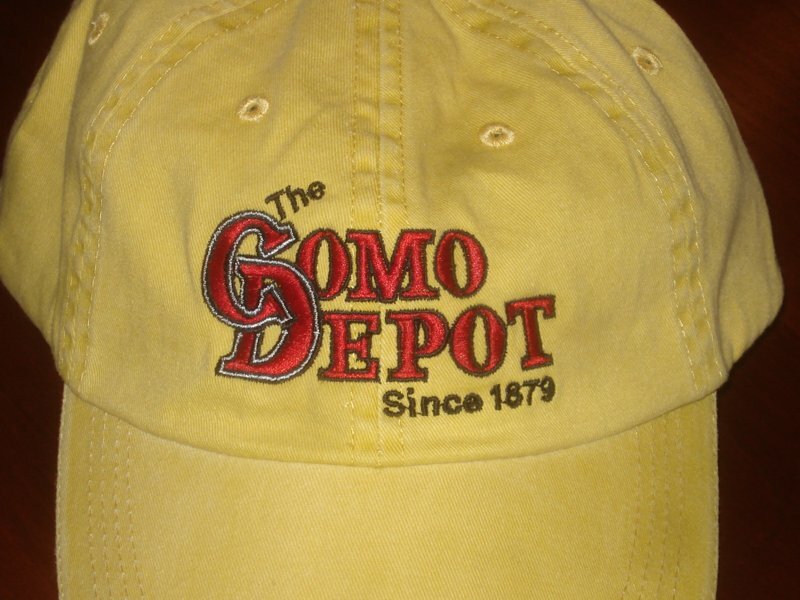 To commemorate the restoration of the Como depot, the society is offering Caps and Shirts with a unique “Como Depot - since 1879” logo. As with all Society sales, proceeds go towards historical preservation fund. This fund supports worthy projects such as the Como depot restoration. 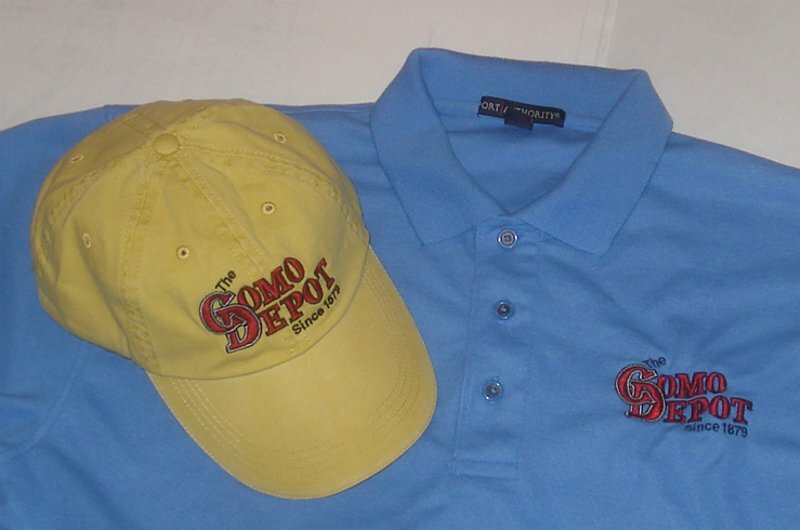 The Polo shirts come in light blue and yellow-gold, T shirts come in light gray and dark gray, sizes M-L-XL-2XL (mens) and M-L-XL (women). 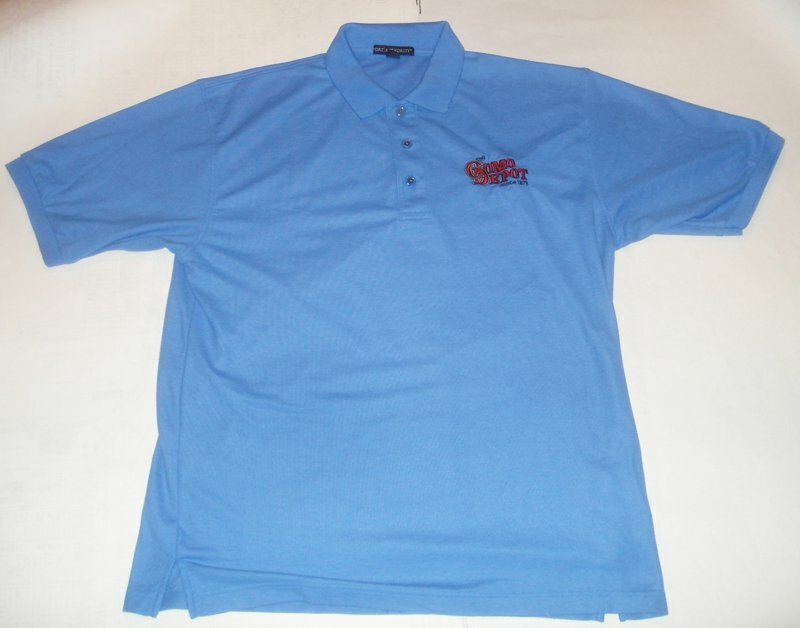 Prices are $25 for Polo shirts and $15 for T shirts, plus $2.50 per shirt S/H. The ball caps come in 1 adjustable fits-all size in yellow-gold and olive drab. Price for hats is $20 plus $1.50 per hat S/H. 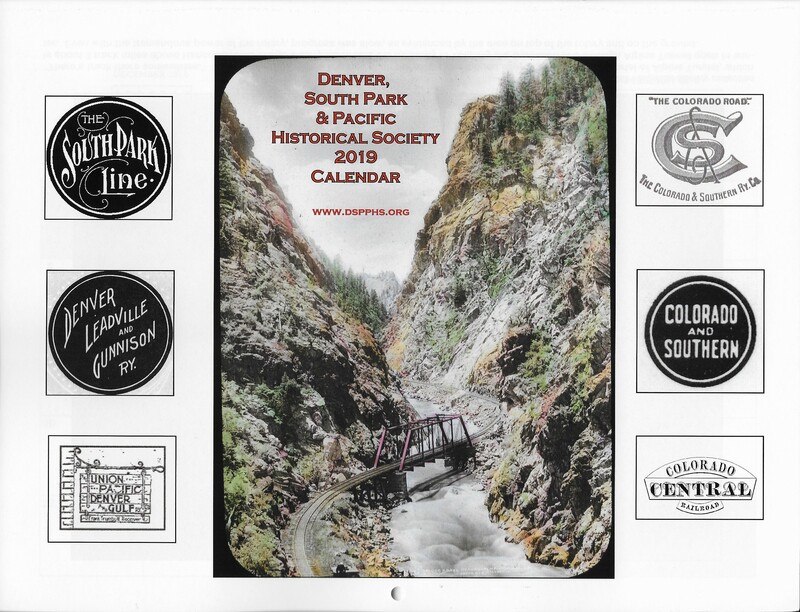 Denver South Park and Pacific Historical Society 2019 calendar. The 2019 calendars are in stock and feature more photographs from the collections of the Society and its members. Many are previously unpublished. We still have some 2013, 2016, 2017, and 2018 calendars in stock (all others sold out) at half price. Like the Society's photographs, all proceeds go to our preservation fund. To order the 2019 calendar, send $15 per calendar ($12 for DSP&P Historical Society members) plus $2.50 per order for shipping to the DSP&P Historical Society, P.O. Box 26, Buena Vista, CO 81211-0026. 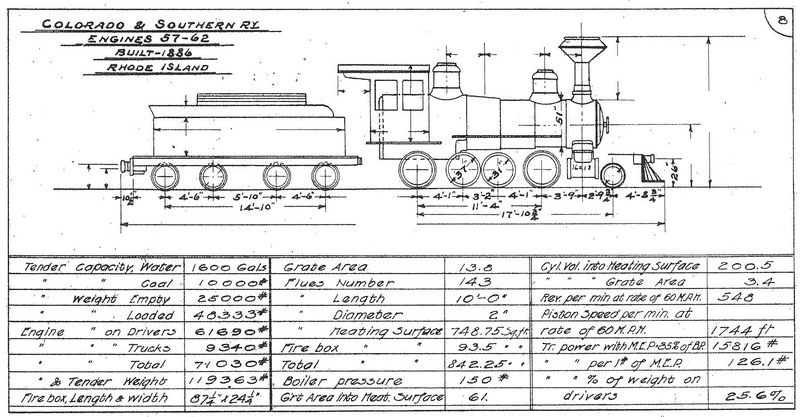 Please make checks payable to DSP&P Historical Society. The Rocky Mountain Railroad Heritage Society is an organization dedicated to saving endangered Colorado Railroad depots. 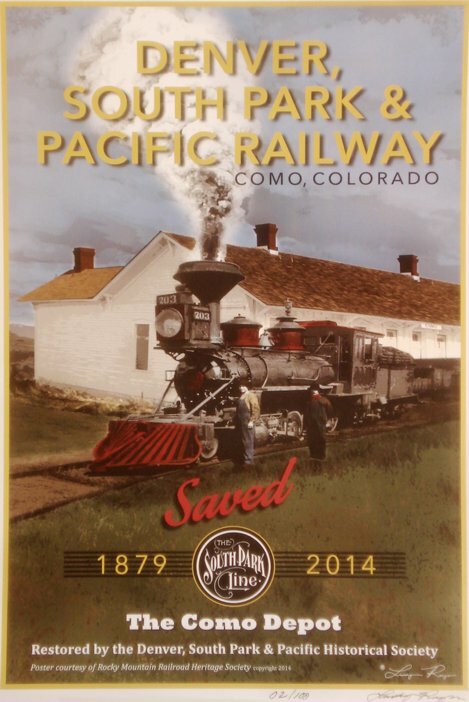 They have commisioned a poster to recognize the successful restoration of the Como depot. 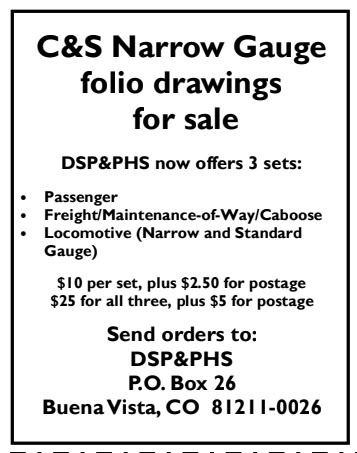 They are selling posters of Como and other depots for $20.00 each postpaid. All proceeds from the sale of these posters support their mission to save the endangered depots. 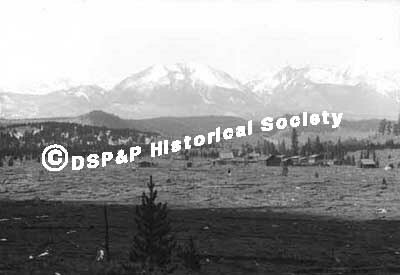 To order, send the price of the selected size plus $10 per order for shipping to the the DSP&P Historical Society, PO Box 26, Buena Vista, CO 81211-0026. Make checks out to DSP&P Historical Society. 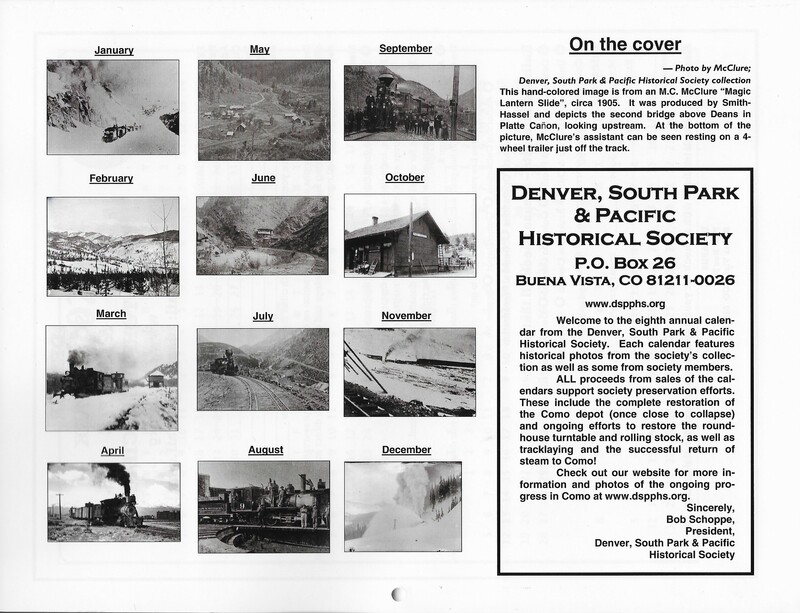 The Denver, South Park,and Pacific Historical Society has accumulated a large quantity of photos from the early years of our favorite narrow gauge railroad. In the interest of making these historical photos available to all, we will now offer high quality, high resolution prints of much of the Society’s collection. All pictures feature very sharp detail unless otherwise noted. Presented here are low resolution examples of a few of the photos we are offering. Be assured that the photos you receive will be of the highest quality. New prints will be added periodicaly so be sure to keep checking back. We will date when photos are added or changed so you can tell what is new. Sizes and prices are as marked on the downloadable order form. While we have attempted to keep the price as low as possible, sale of these prints is a major fund raising source for the work of the Society. 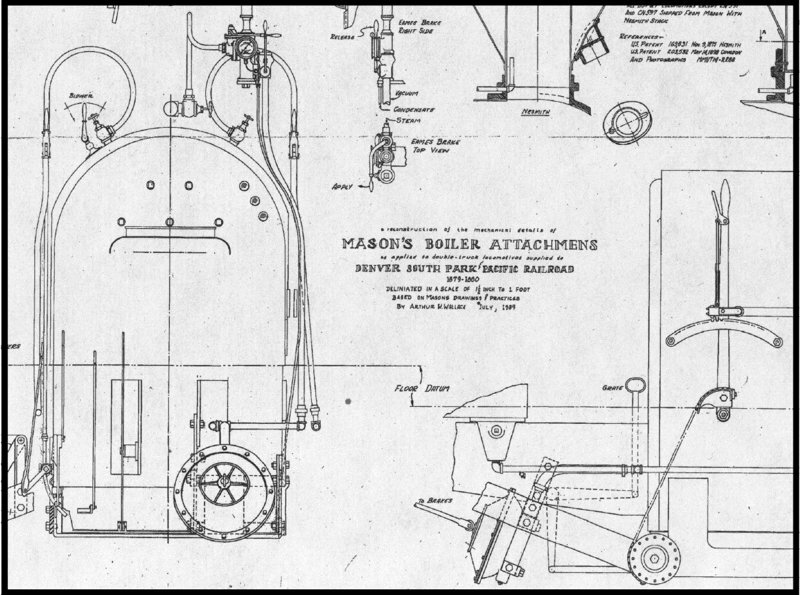 It will enable us to continue to preserve historical items as well as contribute to the restoration of what remains of the lines that all became the Colorado & Southern narrow gauge routes. Temporarily, it will be necessary to mail order your prints until we see if there will be enough interest in these items to warrant a full shopping cart type site. Fairplay, CO 80440 - - - - Make checks out to DSP&P Historical Society. This is a well known view of Kokomo, but you have probably not seen it this clearly. The view is to the west c1890's. 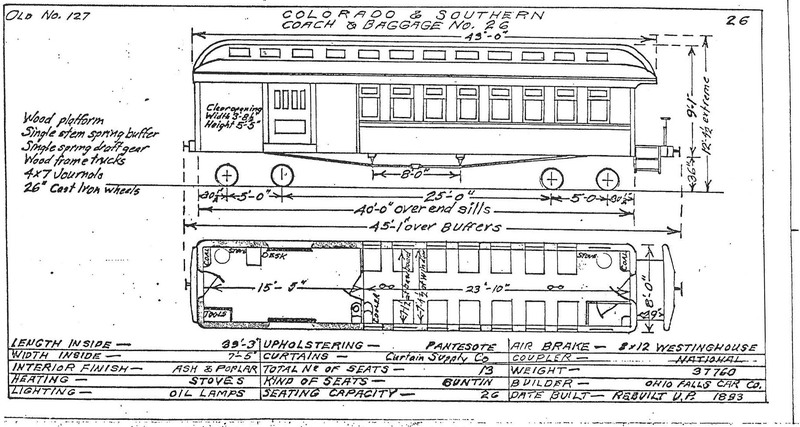 Denver, Leadville & Gunnison eastbound train includes engine 115, baggage 1322 and coaches 65 and 133. 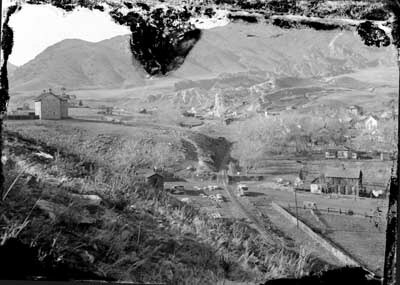 The train is crossing the D&RG track, with the remains of the White Quail smelter behind the last coach and the town of Kokomo/Recen in the background. 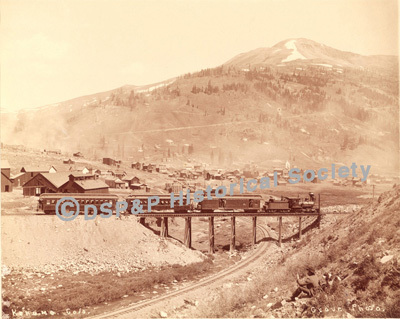 Views of Keystone are quite rare, and this unpublished photo is a beauty. The depot (which still exists), wye, siding, end of track and several freight cars can be seen. From a glass plate negative by Dr. Clinton Scott of Como, c1900. 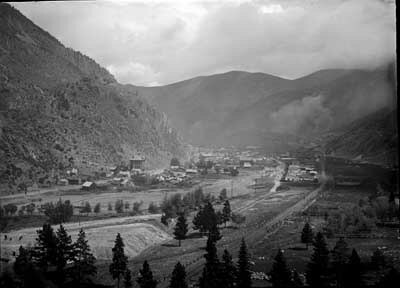 This unpublished view of Morrison, c1900, is from a glass plate negative taken by Dr. Clinton Scott of Como. Looking west, the turntable and depot can be seen.